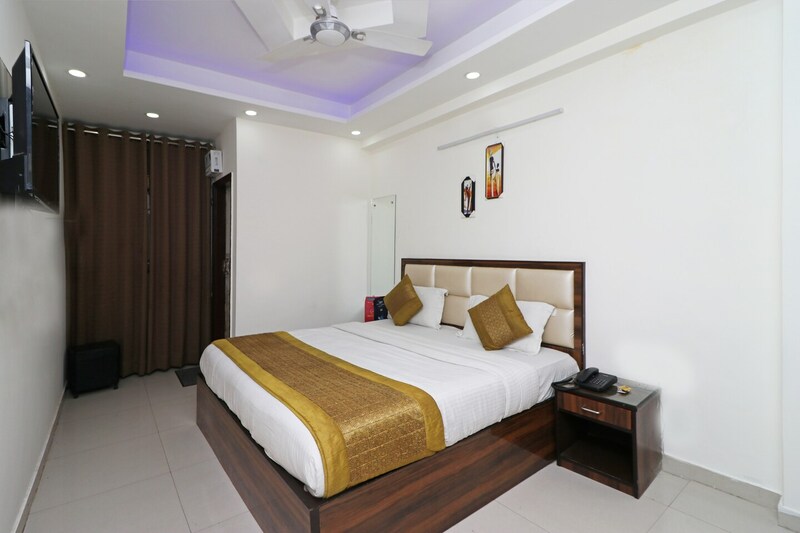 Hotel Sweet Palace is a trendy property with aesthetic interiors, located at Maata Chowk in Mahipalpur in Delhi. It is on Main Vasant Kunj Road and close to Mahipalpur Dairy Bus Stop and Delhi AeroCity Metro Station. Sultan Garhi's Tomb, Rose Garden and Aravalli Biodiversity Park are close by. The hotel has a classy lobby done up in black and white, with modern sofas. The hallways have trendy ambient lighting in blue and purple. The rooms are cosily furnished and feature wall arts. All the rooms of Hotel Sweet Palace feature a television and an air conditioner while the bathrooms with their pretty tiles feature a geyser. The hotel offers free Wi-Fi, power backup, parking facility to the guests along with constant CCTV security. Card payments are accepted. Food joints like Resto 37, Viva - All Day Dining - Holiday Inn, The Hangar - Bar & Lounge - Holiday Inn and The Great Kabab Factory - Radisson Blu Plaza are nearby.